Carax is nearing completion, but I'm having trouble deciding on his head. What do you guys think? Personally I think the hood is kick assand the sword is perfect. im thinking the base needs to be something special. The hooded head does look nice and sinister. While I like the look of the hood, I prefer the 'character' of the bald head. Bald head would be my choice. The hooded head is a little over-used. The non-hooded head has more character. Apparently I am behind the times. I don't recognize the bitz used in this? The Breastplate is perhaps from the new "Stormtrooper" kit? 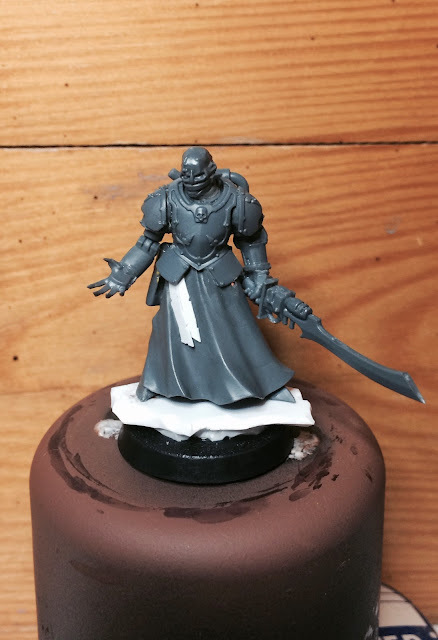 Also, while I like the hood, I think the bare head is a better look for the rogue inquisitor character. Yep. 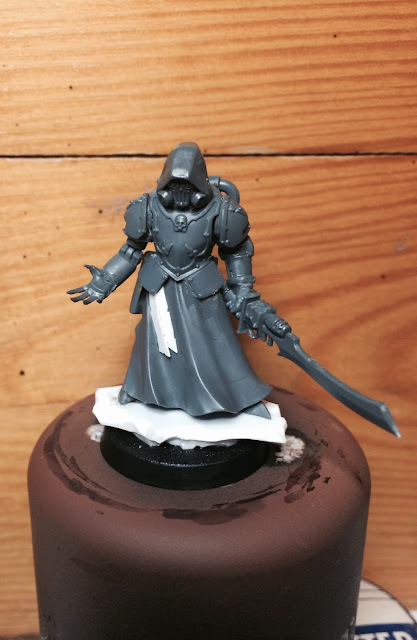 Scion torso on top of the plastic sorcerors legs. Hooded head, but maybe without the resperator cartridges. You could replace them with a hose running to his back, or a set of tusks, or just something different to make it not "that head we have seen 100 times before". The bare head is both less recognisable, and gives him a somewhat more chaotic air- his mouth covered, or tied shut. I assume, with his sword that he conspires with the Dark Eldar/ eldar? I would go with the unhooded head. I feel it holds more esoteric and unknowable qualities. While the respirator is cool, I feel it is so often used in conversions that it loses some of its impact. When seeing it, it is hard for me to think of anything but a cultist. Excellent looking model though; I cannot wait to see what you finally decide upon! As some of you have pointed out the cloaked cultist head is a bit overused, so number one it will be. I prefer the bald head. For an Inquisitor, it think you need to see is eyes. Looking forward to the painted model.